City University London MSc students think up creative proposals for the Transport for London (TfL) Barclays Cycle Hire Scheme. As part of their coursework, students on City University London's MSc programmes in Innovation, Creativity and Leadership (MICL) and Human Centred Systems (HCS), have come up with a variety of approaches for improving the Transport for London (TfL) Barclays Cycle Hire scheme. The City students feel their research will help TfL to get a better understanding of the demographics around the Barclays Cycle Hire Scheme and will motivate users to return bicycles to empty docking stations, among other functions. 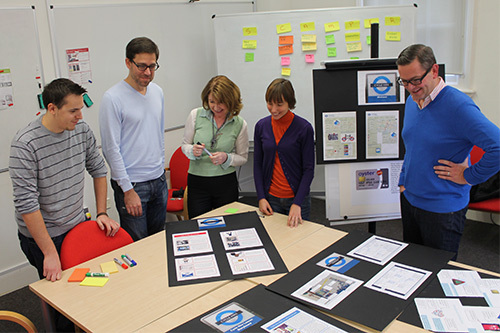 "They were given a challenging brief to creatively think through all aspects of the Barclays Cycle Hire Service, from the software to the docking station design to rethinking the bicycles. They presented a well thought out and visually provocative collection of proposals which TfL officials were impressed with during the students' presentations."